that I ever recall reading." important achievements of this century." "The most interesting science book I've ever read. Zhiliang Gong, University of Chicago. "The most significant scientific discovery of this century. Mae‐Wan Ho, Director, Institute of Science and Society, London. and his discoveries can be expected to have important implications." Brian Josephson, Nobel Laureate, Cambridge University. "Einstein has got nothing on Pollack. "By Chapter 5 I was spellbound. begin again in science and follow the new path this work has shaped." "The most original thinker I have ever met." of matter through the lens of water." ...unveiling the secrets of the world's most common substance. Scientist, Gerald Pollack and colleagues at his University of Washington laboratory have discovered that water is NOT always H2O. When touching most surfaces, water transforms itself into so‐called Exclusion Zone (EZ) water, whose formula is H3O2. EZ water differs in all respects from H2O. And, there is a lot of it, everywhere. The Fourth Phase of Water: Beyond Solid, Liquid, and Vapor documents this fundamental discovery and uses it to explain common everyday phenomena, which you have inevitably seen but not really understood. Professor Gerald Pollack writes in a clear, eloquent style. Whimsical illustrations and simple diagrams help get his points across in a reader‐friendly manner perfectly suitable for non‐experts. 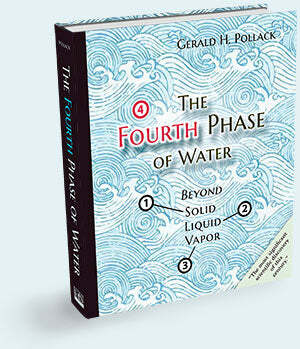 School children learn that water has three phases: solid, and vapor. In 2003 Pollack's group discovered a fourth phase. This phase occurs next to water-loving (hydrophilic) surfaces. 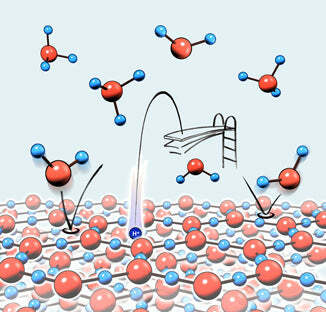 It projects out from those surfaces by up to millions of molecular layers. And, its physical and chemical properties differ from those of ordinary liquid water. For example, the fourth phase massively excludes substances, much the same as ice. Subsequent experiments show that this fourth phase is charged; and, the water just beyond is oppositely charged — creating a battery that can produce current. Light charges this battery. Thus, water receives and processes electromagnetic energy (light) drawn from the environment in much the same way as plants. This absorbed energy can be exploited for performing chemical, electrical, or mechanical work. These new discoveries are rich with implication. Not only do they provide an understanding of how water processes solar and other energies, but also they provide a foundation for a fresh and ultimately simpler explanation of natural phenomena ranging from weather and green energy to biological phenomena such as the origin of life, transport, and osmosis. Bubbles and droplets have similar structures. Droplets form first, then transition into bubbles (Chapter 13). Why do you sink in dry sand, but not wet sand? Water may act as glue. When it contains charges opposite to those of small interfacing particles, it may bond those particles together. So, you can build sand castles (Chapter 8). A lonely white puffy cloud forms in the blue sky. Why? Clouds build from tiny water droplets. Droplets bear charge. Like‐charged droplets should repel and disperse. However, when opposite charges from the atmosphere gather in between those droplets, the droplets pull together, even from afar, to form a cloud. That leaves the surrounding sky blue (Chapters 8 and 15). How can water travel from the roots to the top of a towering tree? Trees absorb radiant energy from the environment, driving capillary action. So long as that energy remains available, water can rise to great heights (Chapter 16). Why doesn’t salt water mix easily with fresh water? Salt water forms a crystal‐like structure. That liquid crystal naturally excludes substances, including fresh water. That explains why streams of fresh water remain unmixed in the otherwise salty ocean (Chapter 11). Water absorbs energy from the sun. That energy separates water’s positive and negative charges. The resulting “battery” may release charge for doing work, just like your cell phone battery (Chapter 5). Yes, of course. However, the fourth phase is H3O2 and that phase is surprisingly abundant: it constitutes the majority of the water in your body (Chapter 4). Does water store information, like a thumb drive? Plausibly. The fourth phase is crystal‐like, and crystals can store information (Chapter 10). Why do injured joints swell in seconds? Injury exposes charged cellular molecules. Those molecules attract water, quickly building layers and causing rapid swelling (Chapter 11). How can diapers (nappies) store 50 times their weight of water? Built of water‐loving materials, diapers strongly bond water, layer upon layer (Chapter 11). Why is ice usually slippery, but sometimes sticky? Positively charged water molecules line the ice surface. They repel one another. Repulsion creates slipperiness — something akin to magnetic levitation. When in short supply, however, those positively charged water molecules may instead glue negatively charged surfaces to one another, creating stickiness (Chapter 12). How do ocean waves maintain their shape as they travel? Fourth phase water lines the water surface, creating something resembling an elastic sheet. Waves propagate easily across elastic sheets (Chapter 16). Why does warm water freeze faster than cold water? Warm water stores more energy than cold water. That energy promotes the transition from water to ice. Therefore, warm water freezes faster than cold water (Chapter 17).